Contemporary global politics is characterised by multipolarity: globalisation and the rise of emerging economies have led to a constellation in which multiple major powers, prominently including the European Union, interact in ways that oscillate between competition (and at times outright conflict) and cooperation. An increasingly significant aspect are the interactions between powers that share a neighbourhood, such as the ongoing struggle between the EU and the Russian Federation over their shared neighbourhood. 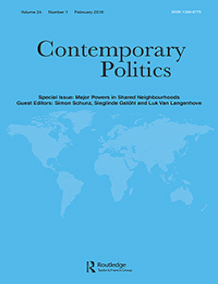 The articles in this special issue consider the EU’s neighbourhood policies vis-à-vis its Eastern and Southern neighbours and its interactions with, on the one hand, Russia and, on the other hand, the Middle Eastern powers, the interactions between China and India concerning their shared neighbourhood and the relations between Brazil and the United States in Latin America.